You can read about the frame by clicking here. my Great-Granddaughter to celebrate Lori's birthday. I have a surprise for her that I will tell you about later. I can hardly wait. frame. Don't you think they look nice together? I used paper from the 6x6 Secret Garden Paper pack, cutting out the Japanese Oval by Cheery Lynn. The Lattice die by Spellbinders was cut out of coordinating paper in the same paper pack. I had a little left on one end, so I use Martha Stewart's butterfly punch. Two of Cheery Lynn's Mini Flourish and a Marianne Flourish, along with some leaves we tucked in behind the rose. 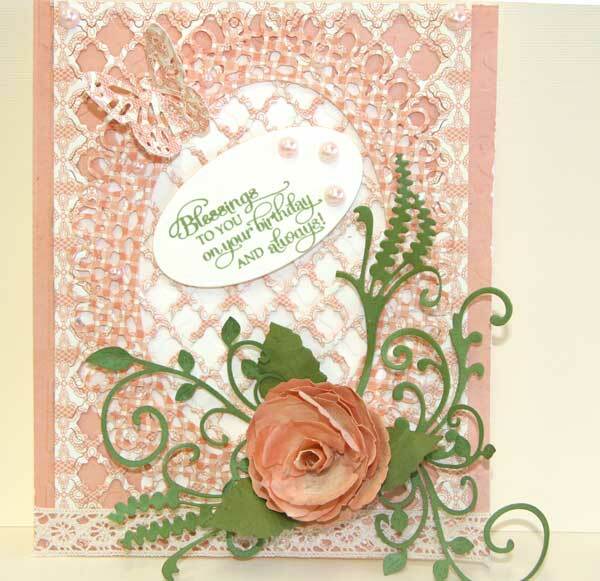 A strip of lace was added to the bottom for texture and the flower was made using Build a Flower #2. Our Daily Bread Birthday Stamp was stamped using Green Memento and then cut out using an Spellbinder Oval Die and popped up for dimension. I also Embossed the card with a Craftwell Embossing Folder. It was just the right size. Kaisers light peach pearls added some interest to the card. I added a piece of lace trim at the bottom to finish off the cut edges. These are beautiful, Joan! I love all the details. Great job! The card and frame are beautiful. Love all the elements on the card. Have a wonderful time today ... I would be excited too .. going to be GREAT fun & interesting!! BEAUTIFUL gift & matching card! Lori's sure going to have a birthday to remember! Sun is shining here ... hope it is there too! Beautiful card. I think that I must order the Build a Flower #2 now after seeing Selma and your beautiful flowers made with this die. Your cards are like a breath of spring when all I see outside is snow, snow, snow. 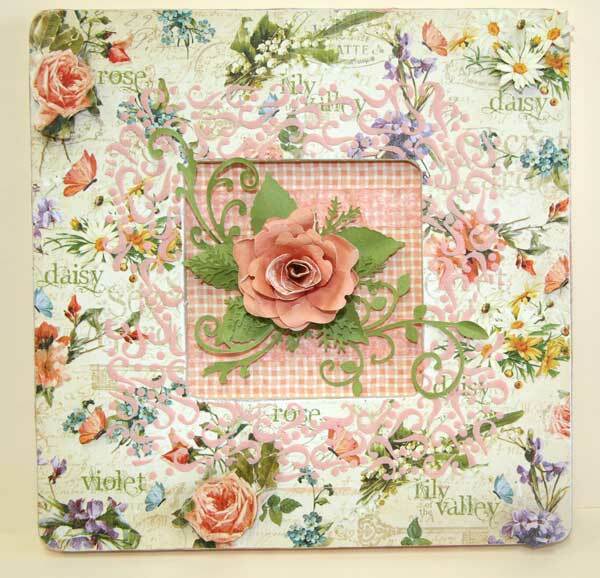 BEAUTIFUL frame and card! I love all the layers you have added to this card. Spring has sprung in SE AZ! The cactuses are blooming! Our spring is a bit different than midwest spring but? 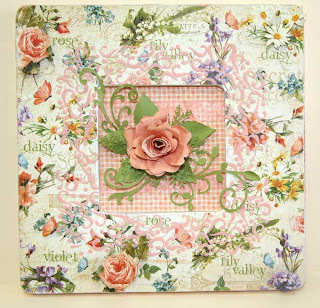 The Secret Garden paper is springtime anywhere!